It is with profound sadness that we announce the passing away of our APSL colleague and friend, Dr Chesmal Siriwardhana, in the early hours of Sunday (09th ) morning, in London. 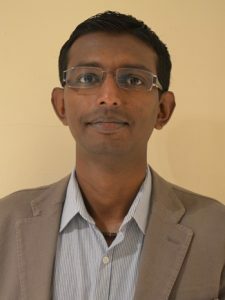 At the time of his untimely demise, Chesmal was one of the Vice Presidents of the Association of Professional Sri Lankans in the UK (APSL), and was serving as an Associate Professor at London School of Hygiene and Tropical Medicine. He was a long standing member of APSL and an active contributor to the Association, from the day he joined rendering his voluntary services to APSL’s activities in the UK and in Sri Lanka. He was appointed to the APSL Executive Committee in 2012. Since then he functioned as the Editor of the APSL Newsletter “The Professional”. He was also instrumental in developing the APSL Young Professionals Events, in which he facilitated the young Sri Lankan professionals in the UK to engage in networking and knowledge exchange. He ably led a team of young professionals in the executive committee to organise these events. In his still relatively early professional carrier, Chesmal’s achievements and contributions were exemplary. Following his school education at Royal College, Colombo, Sri Lanka, Chesmal obtained degrees of Doctor of Medicine (MD) from Peoples’ Friendship University of Russia and Vitebski Dzjaržauny Medycynski Universitet. He obtained his Master of Science (MSc) in Psychiatric Research, Institute of Psychiatry, King’s College London, and Doctor of Philosophy (PhD) from the same institution. Chesmal was a Senior Lecturer in Public Health at Angila Ruskin University prior to his appointment as an Associate Professor at London School of Hygiene and Tropical Medicine (LSHTM). Chesmal was instrumental in founding the Global Public Health, Migration & Ethics Research Group at Anglia Ruskin University, and was also a founding Co-Chair of Migration Health & Development Initiative (MHADI). In addition to his teaching contributions at LSHTM, he was involved in a number of international capacity building initiatives, including qualitative health research courses in Sri Lanka/ South Asia and curriculum development and guest lecturing for a MSc course in Public Health Management in six Eastern Mediterranean universities across Palestine, Jordan and Tunisia. Chesmal’s research interest included global mental health, psychiatric epidemiology, migration mental health (forced and labour migration), enhancing primary care, resilience research, bioethics and humanitarian/disaster research ethics. He conducted mental health research in low- and middle-income countries (LAMIC) including low-resource, conflict/post-conflict settings of Sri Lanka. He was successful in obtaining research grants from several funding bodies and published several refereed research publications. He was an active science communicator. Chesmal’s beloved parents, family and friends have lost their close loved one. Sri Lanka and the humanity had lost a young, intelligent and a highly talented kind person with a bright career ahead of him. APSL has lost one of its active and energetic members. APSL was fortunate to have Dr Chesmal Sriwardhana as a very valuable member, and his services rendered will be remembered with much appreciation. We offer our sincere deepest sympathies and heartfelt condolences to his parents, family and friends. May he attain the blissful peace of Nibbana. Funeral arrangements will be notified as soon as possible. 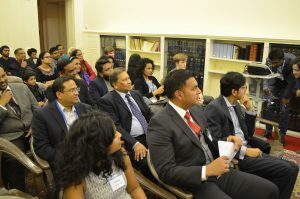 The Association of Professional Sri Lankans in the UK (APSL) held its fifth Young Professionals Event (an initiative to promote knowledge transfer), at the Sri Lanka High Commission, London, on Friday 17 February 2017, with the participation of Her Excellency Ms Amari Wijewardene the High Commissioner. Four dynamic and talented speakers held the audience captive with their personal and professional experiences ranging from Law, Business, Population Health and Leadership. Mr. Suranga Jayalath, currently reading for a PhD in Law at Middlesex University, took the stage first to enlighten us on the fast-changing landscape of the broadcast industry in the age of the internet and how existing laws, established in the post-internet era, are ill-suited to reflect these changes. Dr. Dulini Fernando, an Associate Professor at the Warwick Business School, University of Warwick, discussed some key challenges encountered by migrant professionals in the British workplace. In her brilliant presentation she compared and contrasted seemingly trivial yet important behaviours and attitudes such as critical thinking, the art of conversation in socialising and succinctness in professional interactions, that could determine remaining an outsider vs becoming an insider progressing to the top. Dr. Duleeka Knipe, an epidemiologist at the University of Bristol spoke about her work on analysing trends in suicide and self-harm in Sri Lanka and differences in socio-cultural contexts pertaining to such behaviour in the West and low and middle income countries. Her preliminary findings suggest that Sri Lanka has done well to reduce the rates of mortality due to ingesting pesticides (a common mode of self-harm) relative to other countries in the region and that policies restricting the availability of pesticides might have had a role to play. Rakhitha Dias, the Founder, Lead Consultant and Senior Developer at Terias IT & Business Consultancy, shared his step-by-step approach to developing a leadership mindset both in professional and personal life. He emphasised the importance of doing one’s ‘homework’ to acquire skills to stay relevant by anticipating change in the current dynamic market. He sees the rigid hierarchical structure (reflecting socio-economic status) in the Sri Lankan workplace as a challenge to having a more engaged workforce in Sri Lanka relative to his interactions with his employees in London. The event was attended by a large number of young professionals, APSL members, their friends and family and their questions gave rise to stimulating conversation during the panel discussion that followed the talks. The party then moved on to The Victoria pub nearby where an informal networking session was carried out over dinner and drinks. Dr Chesmal Siriwardhana, Project Leader, APSL Professional Events and Editorial Team, facilitated the proceedings and he was ably supported by Dr Dilrini De Silva and Ms Paola Bethmage (the other members of the team) in organising this event. We wish to thank the four speakers and all those who attended the event to make it a big success. We also wish to thank Her Excellency Ms Amari Wijewardene the High Commissioner and the staff for making the necessary arrangements at the venue. The 12th Annual General Meeting (AGM) of the Association of Professional Sri Lankans in the UK (APSL), was held on Saturday 14th May 2016 at Citadines Apart Hotel, Holborn, London, with the participation of the members of the Association. Mr. Manoj Warnapala, Minister Councillor for Education and Culture at the Sri Lanka High Commission attended the meeting representing the Acting Sri Lanka High Commissioner, His Excellency Mr. Sugeeshwara Gunaratne, who is the Patron of the Association. The following were elected to the Executive Committee for year 2016 – 2017. After the election of the new Executive Committee, Mr. Leslie Dep, the President elect for the year 2016-2017, thanked the outgoing committee for the dedication and hard work during the year and he thanked everyone for appointing the new Executive Committee, and welcomed the new members who joined the Executive Committee this year. He also thanked the outgoing General Secretary Dr. Mahesh De Silva, for carrying out his duties and responsibilities diligently during his two year term with a very high degree of professionalism and commitment. He will continue to be in the Executive Committee. The President congratulated the new General Secretary Dr. Mohan Siriwardena, who was appointed for a two year term. He is a senior member of the Association, and he served as the Membership Secretary of the Association a few years ago. He also thanked the outgoing Treasurer Mr. Thushara Madurasinghe, for his valuable services rendered during his term, and congratulated for being appointed as one of the Vice Presidents of the Association for the year 2016-2017. He will be responsible for the improvement of the financial strength of APSL. The President congratulated the newly appointed Treasurer Ms. Buddhini Liyanage, who has been a very active member since joining the APSL few years ago. The President reiterated the importance of attracting young Sri Lankan professionals into the Association. He mentioned that it will be entrusted to the other Vice President Dr. Chesmal Siriwardhana, to organise events to promote APSL, and attract young Sri Lankan professionals to join us and participate actively in future events and projects. Mrs. Gayani Senaratne will continue in her current role as the Membership Secretary. The AGM came to a conclusion after a presentation on Health Migration, delivered by the guest speaker Dr. Kolitha Wickramage from the International Organisation for Migration (IOM). Dr. Chesmal Siriwardhana who organised the talk introduced the speaker. Dr. Wickramage is based in Geneva, and he has been involved in health migration research activities for a while. Before that, he was involved in the Tsunami rehabilitation work in Sri Lanka. He has also worked for the UN during the internal conflict in Sri Lanka, working in the Vanni District. It was a very informative talk on the work the IOM carries out with respect to the movement of migration in Sri Lanka, especially to the Gulf countries, and how it affects the families left behind, and also the work the IOM does for the welfare of the migrant workers. He also explained the global trends in migration by citing examples from other countries in Asia, and the obstacles they face in getting a better deal for the migrant workers. It was a very successful 12th Annual General Meeting and we look forward to your support and participation in the coming year at all our events and projects. The Chilaw / Putlam Cohort of the APSL Scholarship Scheme was launched at the People’s Rural Development Association (PRDA) Chilaw office on Saturday 7th May 2016. Ten children who had been chosen to receive scholarship funding – seven girls and three boys all attended the event, accompanied by their parents / guardians and their respective PRDA field officers. Under the leadership of Mr Leonard Pinto, PRDA Chilaw Centre Manager, staff (Miss Anne Sachini, Miss Sandamali Deepashika, Miss Jeen Santhusha, ) had organized a warm welcome. Mr Mervyn Silva, APSL IPP and Scholarship Coordinator arrived at the PRDA office by 9.30am, accompanied by Mrs Shanti Fernando, Executive Director, PRDA and Mr Sumal Fernando, her husband. On their arrival, they were welcomed by children with betel leaves in the traditional Sri Lankan manner. After a breakfast of Kiri bath (milk rice), lunu-miris (spiced chillies) and bananas provided by PRDA, the programme started with the religious observances and the lighting of the traditional oil lamp. Miss Sandamali Deepashika of PRDA welcomed everyone and invited Mr Silva addressed the group. After introducing himself, Mr Silva informed the group of Sri Lankans in the UK and told them about the APSL, its origins, objectives as well as their activities. He showed pictures of several leading Sri Lankan professionals in the UK as role models and described their achievements to encourage the children. He told them about the scholarship scheme, its objectives and progress to-date. He congratulated the winners of the scholarships and reminded them how lucky they were as there is a very high demand for these places. He advised the children and their families to do everything they can to make the best use of this opportunity give the children a better future. He finished off by explaining the processes as well as terms and conditions of the scholarship and wishing them success. Mrs Fernando in her speech reminded the mothers and guardians what the funds could be used for and what they should not be used for and explained to them how to send the monthly returns for forwarding to APSL. As part of a planned activity, children were given the opportunity write down the needs and shortages they are currently facing in their education and to identify how the funds could help overcome them. Each child was interviewed thereafter by ?? of PRDA and the following items were mentioned. Books, clothes, shoes, table and chair, reading lamp, tuition fees, bus/van fare, electric iron and football. Thereafter Mr Silva assisted by Mr Fernando presented each child with a pack consisting of the offer letter, terms and conditions and their bank passbooks containing the first month’s funding. During Q&A time, mothers / guardians asked many questions to clarify what the funds can and cannot be used for. Several mothers expressed their gratitude to the APSL and sponsors for their kind generosity in helping their children achieve a bright future. Thereafter the proceedings ended with a vote of thanks given by Mrs ??? after which everyone present was treated to a packed lunch. After the launch, as pre-arranged, Mr Silva travelled to Putlam with the four children their mothers/guardians, accompanied by Mr Pinto. He visited each house, met the other family members and took photographs. Out of the four children from the area surrounding Putlam, 3 are girls and 1 is a boy. Only the boy has both parents. Due to family breakups, all three girls are raised by their grandparents who are too old or feeble to work. All four children are bright and eager to progress but have been held back by economic deprivation. As they all live on the edge of the forest and elephants come out at dusk people dare not go out at night. Our driver was anxious that we leave before dusk. So we left the last house by 4.30pm to make our way back. As it wasn’t practically possible to visit all families in one day, a separate trip was arranged for Mr Silva to visit the remaining six families from Chilaw area with Mr Pinto on Saturday, 14th May. Mr. Silva and Mr. Pinto visited the families of the six children from Chilaw area on Saturday 14th May as planned. Out of the six children from the Chilaw area, four are girls and two are boys. As part of the APSL initiative for promoting knowledge transfer, a young professional event was held at the Sri Lankan High Commission in London on Friday, 20th March 2015. This evening event was well attended by a mix of professional Sri Lankans, representing a range of expertise and experience. Three successful young Sri Lankan professionals based in the UK delivered key-note speeches, on interesting and diverse topics, discussing their journey to success and aspects of their current work. Dr. Rajika Perera, a senior scientist at a fast-growing start-up company in Cambridge, UK is former student of Royal College, Sri Lanka and holds a PhD from the University of Cambridge. His talk titled ‘En route to Kilimanjaro‘ was both a personal reflection of his journey and inspiring discussion of his work in exploring cancer cure. Kanchana Ambagahawita, a Senior Economist at the Central Bank of Sri Lanka and a PhD student at the London School of Economics delivered a talk titled ‘Be the change you wish to see’. She discussed the ‘WorkInSriLanka’ initiative, a volunteer-led brain gain initiative for Sri Lanka, of which she is the founding Chairperson. Dr. Dilrini De Silva, a Computational Bio scientist at the University of Oxford in genomic epidemiology with a PhD from Queen Mary University talked about ‘Genomic technologies in the clinical setting‘. She also discussed her ideas and involvement in promoting career prospects among Sri Lankan school children. A lively panel discussion and a Q&A session followed the three talks where the audience and speakers engaged in a dialogue about various emerging issues around developing professional careers, improving education in Sri Lanka and addressing social issues linked to education in Sri Lanka. The event concluded with an informal networking session over refreshments. The 8th Annual General Meeting and Dinner Dance of the Association of Professional Sri Lankans in the UK (APSL) was held at the Grange City Hotel in Lond on on 12 th May 2012. It was a well-attended meeting chaired by Mr Rohan De Alwis, the President of the Association. In his welcome speech he mentioned that the past year was very significant as APSL received charity status in February 2012. Mr Ranjan Perera, the outgoing General Secretary presented the report for the year 2011-2012. In his report, he mentioned that during the year under review APSL had organised two very important events in the United Kingdom. 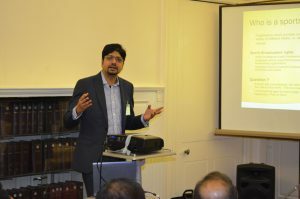 “We Sri Lanka” event on 1st October 2011, where the aim was to promote and encourage reconciliation between the Sinhalese and Tamil communities living in the UK. The other major event was the “APSL Research Symposium” – 3rd APSL Convention held on 19th November 2011. Several researchers based in the UK presented papers and awards were given to the best research paper presented at the Symposium. In addition, the General Secretary also reported of the APSL essay competition held in Sri Lanka for Sri Lankan students under the topic “How to develop the country through the younger generation’s eye”. The response was tremendous and awards were given to the best essays in Sinhalese, Tamil and English at a function held at the Institute of Fundamental Studies in Kandy, Sri Lanka. Mr Suraj Wijendra, the Treasurer thereafter presented the Annual Statement of Accounts for year 2011-2012. The following were elected to the executive committee for the year 2012 – 2013.